Scrying is a system for obtaining information psychically that is by means not accepted by standard science. Mostly the items used are transparent or translucent or reflective. A mirror, a pool of water or liquid or a crystal seem to be the most obvious and accepted forms. And, in the popular mind at least, the crystal ball is the most common. Scrying can also take the form of visiting different astral regions where the Scryer can do this by viewing it through a reflective object, as above, or they can close their eyes and images will appear, or they astrally travel to visit the realms. Scrying is not limited to one, or a small number, of cultures. It seems to be common across the board as a means for seeing other places and other times, including the future. Most Scryers use the medium (mirror, crystal or water) as an aid to concentration and utilise the imperfections in the medium to ‘suggest’ images into their minds. In other words, the medium does not actually do any work, it simply acts as a catalyst for the mind which does all the work. By imperfections I mean those small irregularities in a crystal or a mirror or the rippling of the water in a bowl in addition to the subtle lighting changes caused by the traditional candle especially in a darkened room. 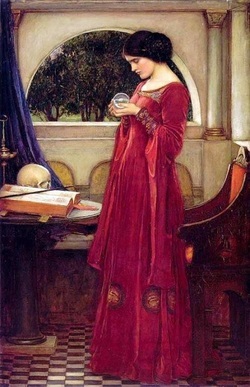 As an example, one crystal ball technique is to relax the mind and stare into the crystal. After a while certain images will suggest themselves to the Scryer who immediately states the image out loud. Once one is said another will appear, which is again said out loud. Apparently, this technique is a form of trance deepening as the mind focusing on the crystal has her focus deepened by the immediate verbal affirmation that comes as soon as she sees the image. This process continues until the Scryer is in a deep enough state of focus to properly commence. And, as an aside, this process, if done properly, can give a great and positive impression on anyone else present. It is also possible to scry using incense smoke, fire, wax and tea leaves. Well, one historical Scryer seems to be known to a lot of people even now and his name was Nostradamus. His technique was to use a bowl of water as described above. The art of Scrying seems to have been discovered in most, if not all, cultures across the ages. In 10th century Persia there was an epic work written which describes the ‘Cup of Jamshid’ or ‘Jaam-e Jam’. This was used in pre-Islamic Persia in order to observe the seven layers of the universe. And as an added bonus, this cup also contained an elixir of immortality. It’s interesting to note that folk lore Scrying methods are often used in ceremonial magick, typical folk lore methods being to look into a mirror, often at Halloween, in order to see your own true love. But beware, because you also have the potential see a skull’s head, which means you will die soon. John Dee, together with his colleague, Edward Kelly, over a long period of time, contacted, via Scrying, what they called ‘angels’ and managed to receive from these angels a system and language for the correct application of magick. As it is connected to the book of Enoch, the whole system and language are called Enochian. As usual, the scientific establishment is generally against the veracity of this type of procedure. At the moment, the experiment giving the best results is the Ganzfield experiment. Here the scrying technique was modified from more traditional techniques in order to achieve proof of alternative information sources interfering with the results. A ‘receiver’ sat in a chair with two half table tennis balls strapped over his eyes and a red light was shone onto the half balls. Also, the receiver had on a headset which played static. This receiver, now isolated from all sound and sight, sat like that for about a half hour. Now a ‘sender’ looks at a randomly chosen target and attempts to send this target telepathically to the receiver. Whilst this is happening, the receiver talks about what he is feeling or seeing. After the experiment, the receiver is shown a number if pictures and has to pick out the one the sender was trying to send. This technique, published in 1974, resulted in a reported significant positive result in favour of the technique working. But not all were convinced and to overcome criticisms of the technique various new techniques were instigated and results obtained. So between 1974 and 1982 these improved techniques were implemented and tested, with the results being published in 1982. Charles Honorton presented a paper at a convention of the Parapsychological Association and basically concluded that some sort of psi was proved by these experiments. Ray Hyman, looking at the same evidence, disagreed and the discussions continued until 1986, when they both published a joint communiqué on the subject. This joint communiqué stated that the positive results obtained were not due to chance or selective reporting but that further experiments were necessary before any firm conclusions could be reached. Further improved experiments were then undertaken with, as an added precaution, two professional mentalists overseeing the experimental arrangements to prevent against fraud, which gave an overall success rate of 34%. Statistically, they should have achieved 25% and the difference is statistically significant. These experiments have continued and the 2010 results achieved a 32% hit rate, again a significant statistical result.